Chris Christensen: Amateur Traveler episode 434, today the Amateur Traveler talks about the one of the smallest but beautiful countries in Europe that used to have a fortress feud across the continent; as we go to Luxembourg. Welcome to the Amateur Traveler, I’m your host Chris Christensen. This is normally the sponsorship spot for the episode. If you would like to sponsor the Amateur Traveler and support the work that we do here, as well as put your company in front of thousands of traveler send an email to host at amateurtraveler.com. Chris Christensen: I’d like to welcome to the show Rosie Titterington, who’s coming to us from Luxembourg, and come to talk to us about that lovely country. Rosie welcome to the show. Rosie Titterington: Thanks, it’s great to talk to you. Chris Christensen: And Rosie is a blogger about family and more and more about Luxembourg. How did you end up in Luxembourg, first of all? You’re not from there I’m guessing. Rosie Titterington: No, I had never heard of Luxembourg, before we moved here as I think probably many people who eventually move here had not heard of it or maybe thought it was part of Germany. We moved here because we kind of always thought in the back of our minds we might like to have an adventure, just try something new. And my husband through sort of a long story. He had a connection here, and he got a job offer and so we thought hey, why not. We’re up for it. Chris Christensen: And why should someone come visit you in Luxembourg? Or not necessarily come visit you. Why should someone come to Luxembourg? Rosie Titterington: Well, there’s several reasons, obviously I’m a bit biased because I live here, but especially if you’re coming to Europe and you’re maybe nervous about languages or being confusing or getting lost. Luxembourg is nice and small and compact, so that makes it very easy to get around to get from to one site that you’re trying to see to another site. It’s also very clean and safe. It’s green and pretty even in the city center. And it’s quite a diverse country because there are so many immigrants and expat that live here. Chris Christensen: And I’m assuming some of that is because the European Union has made Luxembourg one of its three big cities in terms of where things are situated? Rosie Titterington: Yes, and even some American companies have found their European homes here. And then yes, there’s a lot of banking and European activity that happens here as well. Chris Christensen: Now, you say in the center of the city, so you’re in Luxembourg City. Rosie Titterington: Yes, I live in Luxembourg City. Chris Christensen: Which is the big city in the country, and the county is 500 thousand people total and Luxembourg City is about a fifth of that as I recall. Rosie Titterington: Yes, that’s correct. Chris Christensen: So even the capital city is really the size of my hometown, which is a forgettable city in California. So you are talking about a place that is fairly approachable? Rosie Titterington: Yes, it’s very approachable. You can get by with English for the most part. It’s also very family friendly place, there’s lots for families and children to do as well. Chris Christensen: Although, I found either French or German was a little helpful, just in terms of navigating restaurants and hotels and those sort of things that didn’t hurt. Rosie Titterington: Oh, absolutely. Yes it does go a long way even just a “bonjour” or “merci”. Chris Christensen: Okay, excellent. And what would you recommend someone do and see in Luxembourg? What kind of itinerary would you draw for them? Rosie Titterington: To start out you definitely would want to spend a day just exploring the city. And the best way to do that is just by walking. It’s very walkable and the striking thing about Luxembourg as a city is it’s on two levels. So you sort of have this plateau with the main city center and some other areas, and then there’s this sort of canyon ravine sort of thing, that wraps itself around the city center and the main areas of the city. 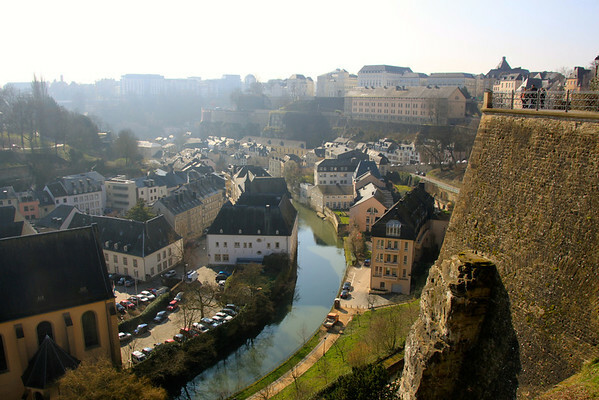 And it’s a got a lot to do with why Luxembourg was sort of a fortress area in over many centuries. 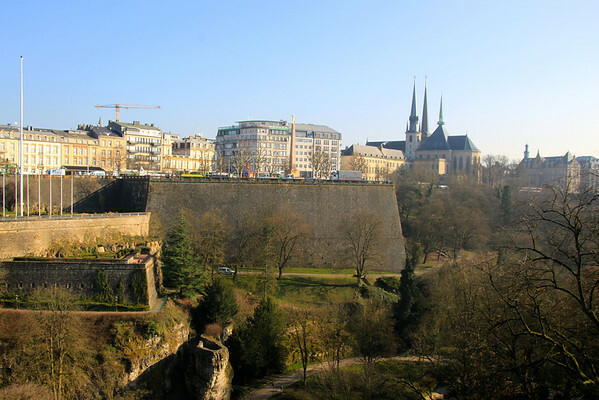 Chris Christensen: Well, Luxembourg was a fortress city. It had a natural defenses and then was built into one of the most formidable fortresses in Europe. So much so that in the 1800’s a big treaty that divided up Luxembourg gave part of it to Belgium also tore down the fortress. So that they would stop fighting over it basically. Rosie Titterington: Right. So it’s on these two levels which makes it really just striking area to walk through. So when visitors come to see us we always take them for a walk down through this valley which is called the Petrusse Valley. We walk through sort of through the southern end of that and around the city center, which you’ll see all the fortresses and the rock formations, which the city sits on top of. So you walk through there and then you walk down through into the Grund, which is a very nice area as well. And then you can keep walking through Clausen and then back up around, and as you’re walking through there you look up and to the side you see the casemates and you definitely would want to go in there because that’s a unique feature. Chris Christensen: a UNESCO World Heritage site, in fact. Rosie Titterington: Yes exactly. And so you can go inside there and imagine what it would have been like to be defending this fortress. And there’s great views then looking out from those casemates. So we always take people kind of down through and then back up and around and into the casemates. And so they’re looking back down into sort of what we just walked through, which is nice and green and lovely with more ruin looking stuff. Chris Christensen: And I’m not sure everyone is familiar with the term “casemates”, so that’s basically this is the remains of what is left of the fortress. And it’s carved into the rock is the reason why they didn’t tear it down. Rosie Titterington: Yes, most of it they closed off, but there’s parts that you can still visit. Chris Christensen: And so were some of the cannons still sitting there, or at least put back at this point. Now I have to say though Rosie, I feel like you’ve undersold Luxembourg City at this point. Chris Christensen: So I’m going to chip in and say, that as you were describing this valley of all the cities I’ve seen in Europe I would have to say Luxembourg City may be the most beautiful. Rosie Titterington: I absolutely agree because now we’ve done a little bit of traveling, I mean I’m not of some great world traveling. But we’ve been to several European cities and the general area and France and the Netherlands in Germany and Belgium. And just walking through the city it’s definitely a unique experience that you would want to see as you’re coming to Europe, I think. Of course I’m biased, but here I have another biased person. Chris Christensen: I wouldn’t say I’m necessarily biased, but in my opinion, just because of what you were describing that two level things that basically it sits up on this big rock. And then the other things that I thought made a difference there is, I don’t know why architecturally the spires of the churches, the buildings are really, really tall and pointy. And so it has a very striking look I thought. Chirs Christensen: And I interrupted you, you were taking us on a tour here. Rosie Titterington: Yes, so anyway. So then after you’ve done the casemates, you’ve gone down there. Then when you come back up absolutely go into the city center and there’s a couple of nice squares there. And you can go by the palace, the Grand Dukes Palace. And I know they do tours of those in the summer, I have not done that yet. But it’s nice to walk by and see that. And across from that we always take visitors to the chocolate spoon place. So we take them to the chocolate house. And here you get these little wooden spoons and on the end is a block of chocolate. And there’s all different kinds of flavors you can chose from for the chocolate. Anything from cinnamon to strawberry to I think you can even have like a little shot of alcohol in them that comes with your little spoon. But so what you do is you dip the spoon into steamed milk and then as the chocolate melts in the steamed milk it creates this wonderful hot chocolate experience. So we always take visitors for that, it’s a big hit. 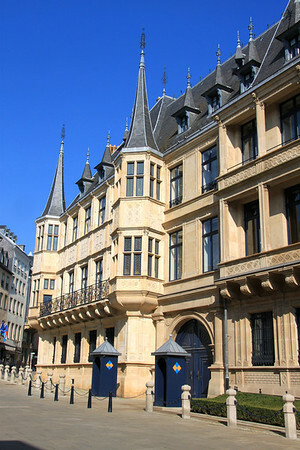 And it’s also a nice thing to take back home for your friends and family if they want know something about Luxembourg. Easy to pack. Rosie Titterington: Because they can make their own steamed milk at home obviously. Chris Christensen: And this is one of the reasons I wanted to have you on, is I was just in Luxembourg this year for the first time, see these are the things I didn’t know. Rosie Titterington: Yes, you have to go for the chocolate spoon. Right now, anytime we have repeat visitor even like my father-in-law, we always go back to get a chocolate spoon. Rosie Titterington: There’s actually a great park right in the city center. It’s a pirate ship park so if you have kids definitely check that out. It’s a giant pirate ship you can climb on it, there’s’ giant slides. Chris Christensen: Now for seeing the rest of the country would you base yourself in Luxembourg City and do day trips then? Rosie Titterington: Yeah, I think that would be a good idea. It’s really easy to make day trips from the city center. And the public transportation from there is great. So it’s a great way to ground yourself I’s day. Chris Christensen: So where would you take us to next then? Rosie Titterington: So one thing that we did with my parents when they came to visit which looking back is sort of a highlight from all the things that we’ve done with visitors that have come is we found out that Luxembourg actually has over a hundred castles? So we thought well let’s pick some castles that look interesting to us and just sort of do a little loop tour of castles. So we went to Bourscheid, we went to Bourglinster, Esch-sur-Sûre those were some of our favorites. The classic one that everyone goes to is Vianden, and I would definably recommend going there, especially if you’re in the warmer months there is a chair lift that takes you from the bottom of the valley up past the castle which is already seated on a nice sort of outcrop hill, it takes you passed that up to a higher hill. And there’s a little cafe up there, and you can have a little refreshment and look down at the castle. And then you can either ride the chair lift back down or you can walk you’re way back down to the castle and do maybe a tour of the castle there which I think is also a pretty worthwhile one to do, in English and auto tour of that. Chris Christensen: And were is that from Luxembourg City and how would I get there? Rosie Titterington: For Vianden, if you’re taking public transportation it’s to the north, it’s basically to the north all but near the German boarder a little bit, but I think directly north. And so if you were taking public transportation you can take a train to either the Diekirch or Ettelbruck station and from there you have to take a bus and the bus will take you right to the bottom of the hill were the castle is. So you can do it that way or you can drive. But it’s about, I’d say, about an hour on public transportation, less than that if you’re driving yourself. Chris Christensen: Excellent. I’m sorry you were taking us someplace else. Rosie Titterington: We did a tour of these sort of I guess lesser known castle ruins. But they’re just in such gorgeous green settings and you can climb around the ruins and see breathtaking views, and they’re not overcrowded. They’re just sweet little castles ruins and so you can hit up probably three or four of these easily within a day. And some of them have just self-guided tours, some of them you just climb around on and that’s about it. But I would definitely recommend doing that. Chris Christensen: And would it be better to car for that day to get around between them? Chris Christensen: Three or four in a day or something like that. Rosie Titterington: Yeah, then you would probably want to have a car, I’m sure you could do a tour of few of them by bicycle of you ambitions. I know Luxembourg is a big biking area as well. Chris Christensen: And the three that you … could you name them again? Rosie Titterington: Bourscheid, definitely go to Bourscheid that’s one of my favorites. It’s just and amazing setting, really. And theirs is an English audio guide there. Esch-sur-Sûre is there all sort of near this Vianden area anyway, it’s all kind of in the north, the middle north of the country I’d say. So Esch-sur-Sûre is another, and in just a beautiful setting. Bourglinster was another one of our favorites. That one is much smaller, but it’s just in a cute little town and it’s really neat because you can see were the new castle was built right on top of the old castle ruins. So it’s interesting to see the demarcation there I guess, you could say. Chris Christensen: And what else would you recommend, that we see in Luxembourg? Rosie Titterington: Also, in that theme general area sort of the middle north east, I guess, area of Luxembourg as you’re close to the German border is this area called Little Switzerland or Petite Switzerland, and the reason it’s called Petite Switzerland is because it has some of these similar rock formation I guess to Switzerland. Certain areas of Switzerland they’re quite striking. So this is great area for rock climbing and also hiking. 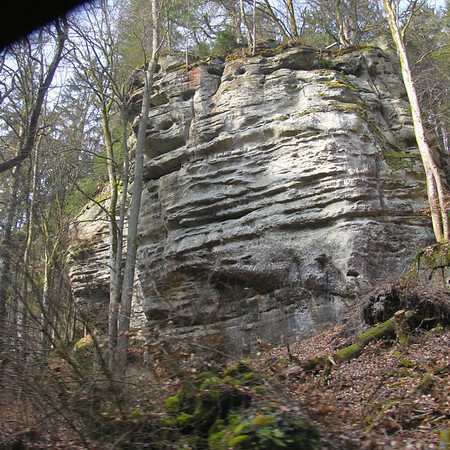 It’s just a gorgeous hiking area, just because of these rock formation that you can kind of meander through. Chris Christensen: And is this on the way to Esternock? Rosie Titterington: yes, it is. Very close by to Esternock. Chris Christensen: I took the bus there and unfortunately the bus doesn’t stop in these little fascinating rock formation in between. And so I watched them go by and when I went and asked how I would get there without a car and it was basically well you’d have to walk in five miles from one direction or another. So this is another place that I think we’re going to want a car. Rosie Titterington: Yeah, but once you get up to that area we picked up a trail map at a camp site in that area. I think it was Berdorf that there’s a camping area. And there was a camping office and we picked up a trail map there. And if you want to go hiking there’s just an amazing wealth of hiking that you can do through there. So, as long as you can get there somehow, then even like you say, there might be places were a bus would drop that would be a great place to hike from. I’m sure you could ask the tourist office about that. Chris Chistensen: Excellent. Yeah, no that looked like a very beautiful area I just wish that I wasn’t just driving through it. Hiking through it I think would be the appropriate speed, yeah. Rosie Titterington: Yes, my kids loved it, too. It’s just this sort of thing you walk in, and you’re like wow. Because you’re driving in this farm land and it’s just flat and there’s not much there. And then suddenly there’s this forest and you go into this forest and all these cool cracks and rocks you’re walking through and giant holes you have to wear … like we saw people with like headlamps and stuff going down into these caves. And so it’s just amazing that Luxembourg, this tiny little county and you’re just driving through these farms and then there’s this little magical forest there. Chris Christensen: Excellent. Anything else we should see while we’re in that area? Rosie Titterington: Yes. I would say recently we did a trip with actually my in-laws to Diekirch to see the World War II museum there. It’s actually a museum with more of Luxembourg’s sort of general military history, but it’s specifically also focuses on the Battle of the Bulge and that particular interaction between the American troops and the Luxembourg troops and it also shows some of the German side, some German soldiers have contributed their stories and equipment and uniforms to that and it’s in this old brewery. And you think it’s this tiny museum and keep going through it and there is just more and more and more stuff from World War II. I have no idea how they packed so much stuff into this tiny museum, but you go and you climb up to one level and there’s a giant room of just military vehicles and equipment. It’s just quite amazing, you could easily spend a day walking through that museum, in fact you’ll probably need break for lunch and then just keep at it again, I would say. Chris Christensen: Okay, anything else we should do in terms of the tour of Luxembourg in general, before we start asking some of our typical questions? Rosie Titterington: No, I think that if you spend some time in visiting the castles, if you spend some time visiting a museum and doing some hiking, I think that’s kind of the general idea what Luxembourg has to offer. Chris Christensen: Excellent. The one museum you say that just reminded me. I enjoyed also in Luxembourg City the museum that’s in Fort Thungen, which is sort of across one of the chasms from the main city over by where a lot of the EU building are. But it’s one of the remaining outline Forts, and inside there they had a good history museum of the history of Luxembourg, which I enjoyed. Rosie Titterington: The striking thing about that museum is its backdrop also against the modern art museum which is right behind it. So you get to see, that’s really a typical Luxembourg scene there; is these modern building and then these really old buildings right next to it. I suppose Europe is like that in general, but Luxembourg has I think a unique contrast of the two that’s really striking. Chris Christensen: Excellent. What did the guide book recommend, you talked about what we should do, but what do the guide books recommend that you think are a little bit of a waste of time? 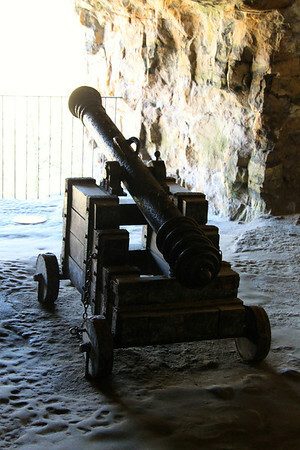 Rosie Titterington: If you go visit the casemates, yes you should visit the casemates. 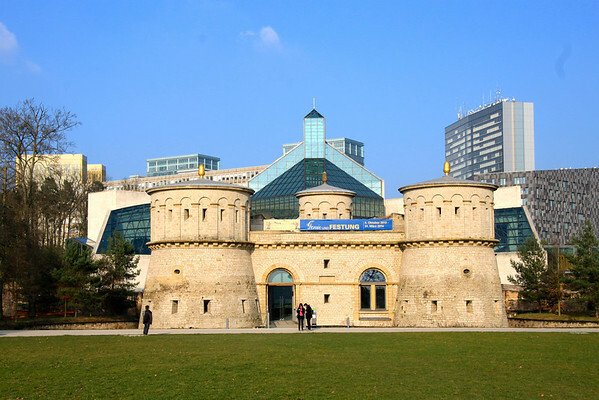 I think probably the Bock casemates is enough, I’ve heard that there’s the Petrusse casemates as well, and those are open only certain times of the year. And I heard they’re just a bit kind of dingy and slippery and little bit maybe dark. Whereas the Bock casemates are, yeah, there caves but they’re also open and easy to manage. Chris Christensen: Okay, and then any hidden things that we wouldn’t read about in the guide books, but now that you’ve been living there your kids love for instance, or the visitors you take just really enjoy that little spot. Rosie Titterington: One museum that is very specific to Luxembourg is the Milk Museum. And I don’ know if all the guide books recommend this because it’s a little bit odd, but it’s this state of the art, first of all it’s a processing facility for Luxembourg’s brand of milk, which is Luxlait. And so what they’ve done here at this processing facility is they put this museum attached on. And what you do, is you go in you put on your little lab coats and then you’re 3-D glasses, and there’s this 3-D presentation of how milk comes from the cow to the store. And then you get to kind of tour the factory in your little lab coats, I mean it’ sell blocked off, so it’s sterile. But it’s just very state … I don’t know how much money went into this thing but it’s very unique experience for kids and we learned a lot too. The adults who went. And then they have when you’re done with the tour they have some interactive stations for children mostly on the wonderful benefits of milk to your health. But you can ride little bicycles and treadmill. It’s a great way for kids to get their wiggles out if you happen to be there on a rainy day and can’t visit one of the amazing parks. Chris Christensen: Excellent. Any recommendations for places to stay or places to eat? Rosie Titterington: As far as places to stay goes, really the only recommendation I could maybe give is areas, I know the youth hostel is actually in a nice pretty spot, so if you’re into that then that’s an option. There’s good camping sites, but as far as just were you might want to stay if you’re staying in hotel, if you were to stay in the Grund area of the Clausen area or the city center it’s just right around the city center, those are very attractive they’re probably more busy with nightlife, and probably more expensive. If you wanted to still be in the city, but maybe you wanted to just walk into the city from your hotel. I would recommend maybe the Limpertsberg or Bel Air area because these are very easy to walk into the city from. Kirchberg, the modern area of the city with all the EU buildings has some really nice hotels there. But you probably wouldn’t want to walk from there. You would want to bus in from there just because it’s busy streets, and what not. The last thing I’d say is that if you were going to stay near the train station just don’t stay right near the train station. Chris Christensen: You just put exactly my hotel on the map. Rosie Titterington: I mean, it’s all relative. I mean, Luxembourg is a very safe and clean city. So it’s not to worry if you’re by the train station. But maybe not staying right on Strasburg or rue de Hollerich the streets that are right next the train station might be advised a little bit away from that you’re golden. So, no problem. Chris Christensen: Great. 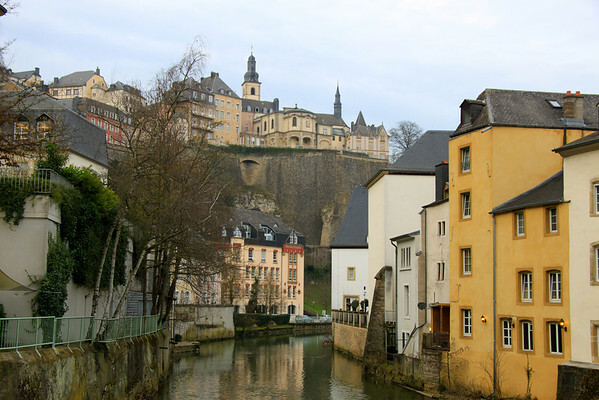 What’s going to be the biggest surprise for somebody who’s never been to Luxembourg? Rosie Titterington: I’m always surprised and I think that our visitors have been surprised, that it just has so much variety packed into this tiny little country. 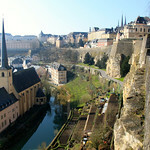 Its surprises me even that many people who live here haven’t taken the time to explore all that Luxembourg has to offer. They seem to want to go further afield. Between the castles the hiking that you can do, and just the beautify of it all and the variety of landscape. I think that was surprising to me. And when people come to visit us they say, “Hey, for a country that I never even heard of or read about in any guide books, this is actually really, really nice. And we kind of have a joke in our family that the reason Rick Steve’s and some of these other well-known travel writers haven’t’ mentioned Luxembourg is actually because they really love Luxembourg and they want to keep it a secret. So that’s our theory. We like it. Chris Christensen: What time of year or what day of year would you recommend people come to Luxembourg? Rosie Titterington: Well, my husband visited Luxembourg for the first time at Christmas time when he was meeting his friend. It ended up being the connection for his job and that actually convinced him I think in part to move here. So I have to definitely recommend Christmas time because we do have the Christmas market and of course a lot of the countries nearby have their own Christmas markets. So Christmas is lovely, also in the summer of course is gorgeous. Yes Luxembourg tends to be a little bit rainy, it’s similar to where I’m from in Portland, Oregon. So it’s not that big of a deal to me. But that’s what makes it so green and beautiful. So if you don’t mind a little rain. Then come anytime. But I would say late summer earlier fall is probably the most beautiful time for Luxembourg. Christ Christensen: Okay. Then, you’re standing in the prettiest spot in all Luxembourg, where are you standing and what are you looking at? Rosie Titterington: Wow, that’s hard to choose. It’s definably somewhere down in the Petrusse Valley. There is this bridge in the Grund were you can actually, we didn’t mention this before you can take an elevator from the city center up top straight down to the Grund area, and there’s a bridge area over river and you can see kind of up to the city and the area around is just gorgeous. And I think it’s probably legally required that you have to take a photo there, if you’re in Luxembourg. So that’s kind of the classic spot where everyone would think of if they were thinking of Luxembourg. You continue on past that area though, if you continue north I guess you’d say, you’ll head towards Clausen, you’ll walk back by the Abbey that’s down there that’s got one of those steeples that you mentioned earlier. So you walk by the Abbey and you’ll kind of wind you’re way through some ruins and then you’ll get to a part of the river that sort of has a mini waterfall. And this is apparently were the lower class used to do their laundry on this little waterfall here. And there’s actually a little plaque or a sign and it has a picture of people doing their washing on this little mini waterfall. And that’s just a gorgeous spot there, you’re looking back up at the casemates and across over toward the Abbey and there’s a bridge. It’s actually currently the header on my blog, the picture at the top of my blog is that. I think one of those two spots and your breath will be taken away. Chris Christensen: And actually that reminded me we were talking about things you can do with family. But for people who are traveling who may be looking for more nightlife, it also accrued to me if we continued down that river we also get to the brewery area. To where they’ve done a lot of renovation and things going on there too. We should mention that. One thing makes you laugh and say, only in Luxembourg? Rosie Titterington: You might see the same person three times in one day just walking around the city. Chris Christensen: I completely understand what you’re saying. It’s surprising to me how small the city is, because it doesn’t look that small and being a capital city it doesn’t feel that small. And yet I could completely imagine that you would … it is just not that big. Last two questions. You really know you’re in Luxembourg when, what? Rosie Titterington: When you’re on the bus or a train and you’re pretty sure you just heard about ten different languages being spoken. Chris Christensen: And if you had to summarize Luxembourg in just three words. What three words would you chose? Rosie Titterington: Charming, striking, and surprising. Chris Christensen: Excellent. Our guest again has been Rosie Titterington, and Rosie were can people read about your travels and your life in Luxembourg. Rosie Titterington: I have a blog it’s called the T’s as in Titterington. And it’s at PeteandRosie.blogspot.com. Chris Titterington: Excellent. Well thank you for coming Amateur Traveler and sharing with us your love for Luxembourg. Rosie Titterington: Thanks, I’m always glad to speak about Luxembourg. Chris Christensen: In news this week you may recall that we talked about the Knee Defender awhile back on least this week in Travel I think we may have also brought it up on Amateur Traveler. But it’s a device that keeps the people in front of you from reclining their seats. Now, most airlines ban the use if the Knee Defender because they have the rules and you’re not above them. But this week a fight broke out on United Airlines plane because a man sitting the middle seat of row 12 used the Knee Defender to stop a women in front of him from reclining while he was on his laptop. The flight attendant asked him to remove the device and he refused. The women stood up, turned around, and threw a cup of water at him. United landed the plane and take them both off. No one was arrested but you can get arrested and fined up to $25,000 if you cause an unscheduled landing of a flight that this. The irony is the passengers were already sitting in United economy plus that has four more inches of leg room. For a link to that story look in the lyrics of this episode of the Amateur Traveler were you’ll find that and all other links that we mentioned on this show. With that we’re going to end this episode of the Amateur Traveler. If you have any questions feel free to send an email to host at amateurtraveler.com or leave a comment on this episode on amateurtraveler.com and you’ll find a link to be again and the lyrics of this episode. You can follow me on twitter, christ2x and as always thank so much for listening.